Join us at the annual Christmas Bazaar on December 8, 2018 from 9AM-3PM, at Bruton Parish Hall, Duke of Gloucester Street, Williamsburg. 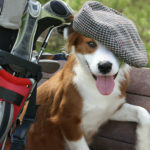 All proceeds benefit homeless animals at the Heritage Humane Society. You’ll find unique gifts and stocking stuffers for all the people and pets on your list. Come early for the best selections of gourmet soups and baked goods for your celebrations. We have themed baskets and hand-crafted gifts, as well as a wide selection of jewelry, scarves, books, stuffed animals, holiday decorations and more! 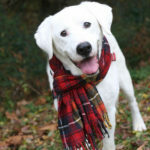 Your favorite pets will enjoy toys, togs and treats in their holiday “critter baskets”. Try your luck at our raffles, with a chance to win exciting prizes. 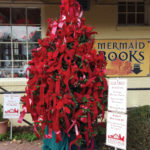 The long-standing tradition of the Fur Tree, in honor of pets and homeless animals, is placed each year in front of Mermaid Books in Colonial Williamsburg. The tree is put up each year on the weekend following Thanksgiving and remains there until after New Years. 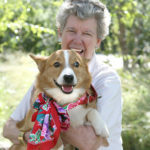 The Heritage Humane Society Auxiliary is now offering private sales of gently used ladies scarves. We’ll come to you and your friends! A member of the group will illustrate the use of the scarves to enhance and extend one’s wardrobe. Are you part of a social club? Host a scarf party event, and all proceeds will benefit the homeless. It’s a fun, easy and beneficial way to make a difference. The display and sale of the scarves includes every fabric, size, shape, and color. Prices range from $5 to $40. All proceeds go directly to the homeless pets at Heritage Humane Society. Interested in hosting a scarf party? Click Here. Online registration begins online on July 1, 2018. Join us for a day of spectacular golf, delicious food including a boxed lunch and a dinner buffet, cold beer, contest holes, and camaraderie at Williamsburg National Golf Club. Gather your foursome or come alone and make new friends. We hope to see you on September 21 for a day that is sure to delight! The fear and anxiety that comes with being abused, lost and abandoned can be overwhelming for our homeless pets. 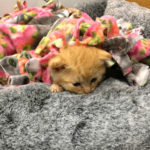 Although they are treated with great care by both the Heritage Humane Society staff and the dedicated volunteers, adjusting to new surroundings takes time. 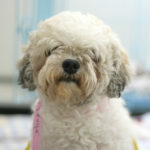 Wanting to help make the transition more calming to all the shelter animals. Generous volunteers create handmade blankets for every dog and cat that gets adopted at Heritage Humane Society. More than 5,000 blankets have been given out since “Precious Pieces” started several years ago. If you like to knit, crochet or sew, please email [email protected]heritagehumanesociety.org to learn more. A booth at the Williamsburg Antique Mall is provided to us without charge in return for our members donating time on Fridays to package and wrap mall purchases at the front desk. Members of the Auxiliary and community support our mission to raise money for the shelter by donating items to sell in our booth. If you have items to donate or would like to volunteer, please contact Connie Jacobs, [email protected].